The Vietnamese diaspora is featured in each of the eight stories in the collection Toad Poem, though the stories feature a diverse array of themes and characters -- a son discovering the secret behind his refugee father's investment, a woman of faith embroiled in a kind-of love triangle, children searching for the secrets to their parents' histories, a swimmer on a remote island finding solace among some fellow divers. They also range broadly in setting -- from Vancouver and Winnipeg, to New York City, Vietnam, and Korea. The stories capture some of the diversity in the experiences and sensibilities of a vast and far-flung community, but are ultimately linked by the shared urgency that binds the lives depicted on these and other shores -- the drives for love, prosperity, acceptance, and self-understanding. 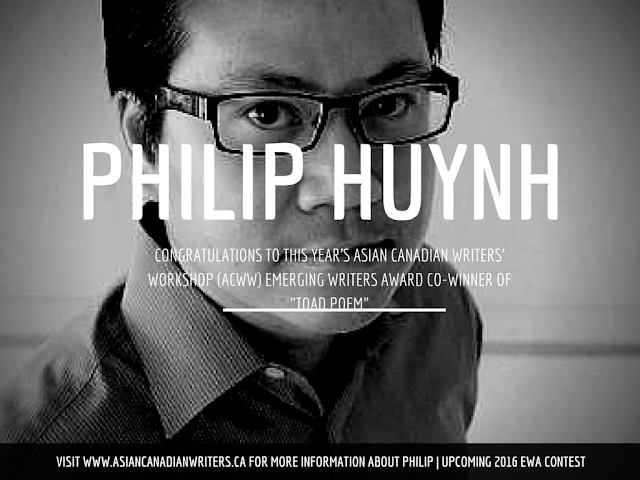 Philip Huynh's stories have been widely published in literary journals and in the Journey Prize Anthology. He studied at the University of British Columbia and the University of California at Berkeley. He lives in Richmond B.C. with his wife and twin daughters."